1. White Blazer (Narciso Rodriguez for DesignNation). Regulary $84, but I got it for $18.95. A white blazer wasn't on my mental shopping list, but I tried this one on and it fit like a glove. It's also really long (my torso is creepily long) so I just couldn't pass it up. It also has lovely tuxedo stripes down the sides. Gah, it's just really cute. 2. Lace Tank (Sonoma). It's really difficult to tell what it looks like in the picture, but it's basically a lacy off-white tank. I like that it's thick so my bra won't show through. 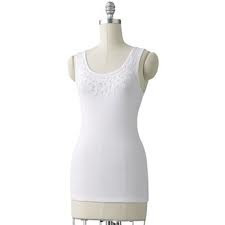 I often wear a plan white tank under cardigans, and I thought the lace would be a cute way to take things up a notch :) It was originally $20, but I got it for $14.99. Interested in My Past Budgets? I love that you write out, gah. :) So, Ashley! Ahhh... I LOVE steals from Kohls! Kohls is like a cult for me.. I have their card (Thanks, Husband) and they send me tedious coupons along with huge sales! HELLO!!! I.cannot.resist! Haha, they asked me if I wanted a Kohl's card and luckily I was able to resist! But I had a great experience so I'm sure I'll be back! Wow! You did amazing! I love that white blazer! Thanks Rachel - it's such a cute blazer! Kohl's always has crazy deals! I don't go there as often anymore because I don't live super close to one...and I used to work there so...bad memories...haha! But I love that white blazer! Good choice! I used to own a blazer like this that I wore a lot when I worked in an office in the corporate world. Then I found a different job in the art field & everyone wears Anthro looking stuff, so the blazer & pumps went to the Thrift store. Reading this post just made me chuckle !! !The blazer that I now wear from Anthro is a ticking stripe with a ric rac trim edge....so if you change careers, you could always funk up the blazer by sewing ric rac trim along the edges. Oh wow, what a great idea! Of course that idea would come from Anthro - gah, I would wear ONLY their clothes if I could! I haven't been to Kohl's in years, but I have also been seeing super cute stuff on other blogs. I actually got a gift card to Kohl's for Christmas, so I am excited to check it out and see what I find! Love that white blazer! Yay for gift cards! You should definitely go soon - the sales are CRAZY! I LOVE that white blazer! and what a great deal!! Thanks, Katie! I'm hoping I'll figure out a lot of ways to wear it! Yay - I'm happy to hear I'll have a lot of ways to wear it! I might have to go through your archives and see ways you've worn yours! I can't wait to see how you style that blazer! I saw it a while ago at Kohl's, and considered getting it, but didn't feel it was worth 1/4 of my monthly budget. Also, thanks for stopping by my blog and leaving such a genuine and useful comment. Hopefully now that I've admitted to having a problem, I can take the next step and fix the problem! I'm really excited about the blazer - I'm hoping it becomes a closet classic! And, I appreciate you being real on your blog, Kate - I feel the same way about my blog sometimes too. I'm excited to see how you move forward in all of this! I love a good buy - had some a few weeks ago at Gap! Perhaps we could follow each other? It's the best time for sales! I'll come visit you, Lulu! Thanks Joyce - I'm excited to wear it! Hi darlin! Thank you so much for visiting my blog! 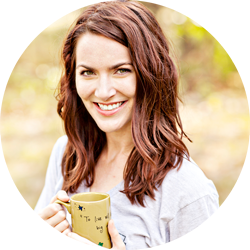 Would you like to follow each other on GFC & BLoglovin? Just leave me a comment on my blog and let me know! Thanks:)! Hi Rita! Thanks for stopping by! I will head to your blog right now! I'm following you right now, hope you will do same! Thanks, Alexandra! I'll come visit your blog soon! The blazer is great! Lovely blog. What about following each other? I think a white blazer is a great piece to have in your closet. I'm thinking of getting one myself!